Most electric bikes are designed to look and function like a regular bike, which makes them easy to substitute for regular bicycling use. However for my purposes being able to carry 2 bags of groceries and a 40 pound bag of dog food (and sometimes a dog too) over 10 to 20 miles is necessary. It would be even better if there was protection good enough to handle 90% of the weather. And I'd also like to extend the range from 70 miles to 120 miles and still take only a few hours. As I think about building another bike, here are a few loosely connected ideas that help to define the outlines of what I'd like to build next. None of them will do everything I would like- but some combination might work. Notice the fender wrap around the front wheel. 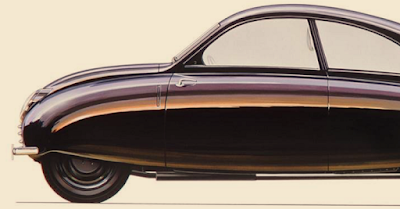 Normally this would limit how far the wheel could turn for steering, but Saab made the body extra wide for clearance. Could this be made to work on a bike for aerodynamics and rain control? 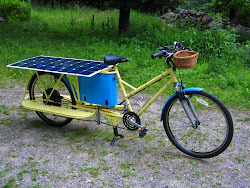 A solar panel mounted over a bike front wheel would be about 22" wide, but I'm also trying to keep everything small and light. This is not a bicycle- there are no pedals, he's using moped speed rated tires and turn signals, and it's registered. The bottom part of the doors hinge open so that he can put his feet down at stops. One report credits this enclosed electric scooter with 24 to 26 Wh/mile and a 150 mile range at 40 mph speed, and another report with a newer battery pack lists a 150 mile range at 50 mph. My bikes generally use about 11 Wh/mile at 15 mph, 16 Wh/mile around 18 mph, and maybe 20 Wh/mile around 20 mph, (depends on how hard I'm pedaling, weight, wind, etc), so the streamlining is definitely working (he is also using a very efficient motor), I think this photo was taken around 2000, and Cedric has since moved on to building more powerful motors, It is possible to get a lot more sophisticated than this bike, such as a Carver One, LIT C1, EcoMobile/MonoTracer/ZeroTracer or MonoRacer, but this is closer to what I'd like to build. Operating speed for this steam locomotive was about 55 to 65 mph, and it's fuel was coal. (Trains of this 4-6-4 configuration could sometimes reach 100 mph on long flat routes.) This was built during the period of "modern" streamlining. I like the comparison of this locomotive to Cedric's early scooter above, but his later scooters look more like locomotives designed by Otto Kuhler for ALCO. This bike is appealing because of it's lightness, the smooth shape and easy to access rear mechanicals, but with a regular (i.e. 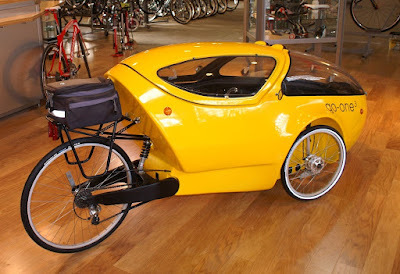 larger and heavier) velomobile like a Quest or Mango I could also make a space inside the back section to carry groceries protected from the weather. If I'm building a fully enclosed body, I'd also like to try to put more than 200 Watts of solar on it and the long hood on a regular style velomobile could possibly fit 100W to 150W. Tōkaidō Shinkansen N700 series train at the Maibara station, Jan 2011. 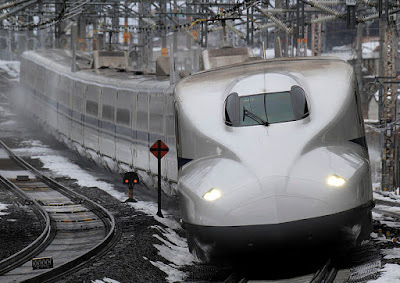 This train has an operating speed of 175 mph, and uses 25 kV AC electric power. It looks a bit like the Porsche 919 LMP (Le Mans Prototype) race car I mentioned in my Bicycle Bodywork (4 of 4) bike fairings blog post, and actually both vehicles are running at about the same speed. This body style could blend well with a solar panel on the roof. 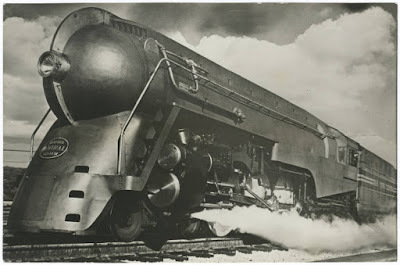 Pennsylvania Railroad K4S locomotive, designed by Raymond Loewy, 1936. 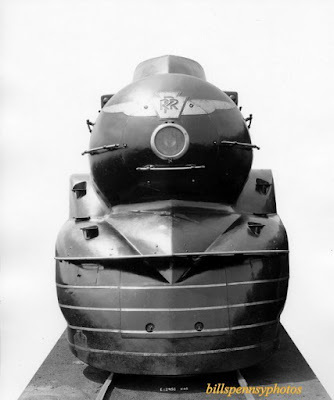 Interestingly Raymond Loewy was heading in the direction of wide front aprons with a central Vee on his locomotive designs in the 1930's, but he still had to keep a prominent round nose for the front of the boiler instead of a driver's cab. 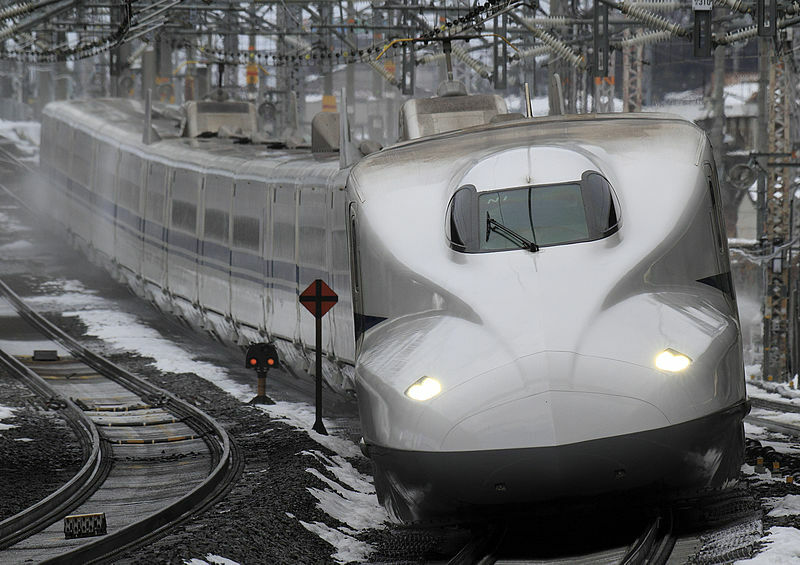 The Shinkansen aerodynamics are probably better quality- most likely they've actually been tested in a wind tunnel. 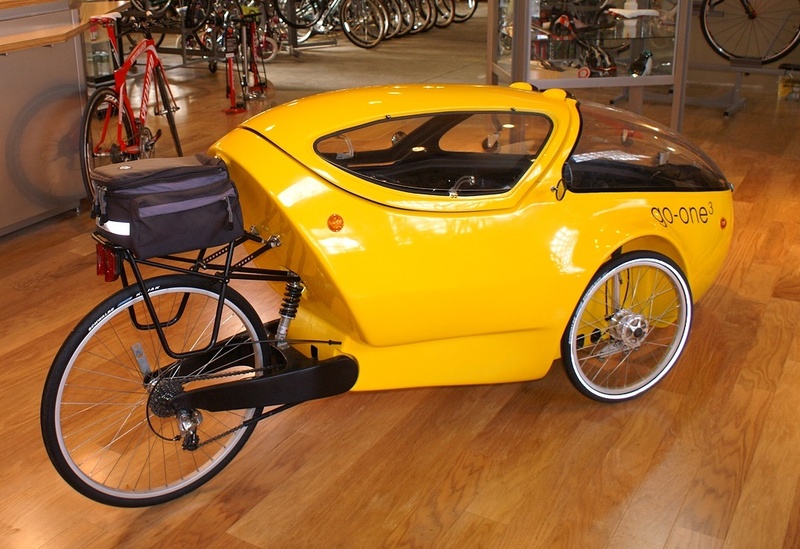 This bike has about 450 watts of solar panels overhead, which could be made rainproof for weather protection. Bernard traveled 7000 km in 25 days (an average of 280 km per day), or about twice the distance of the Tour de France in the same amount of time, and while carrying his camping gear. Raf Van Hulle on a more upright posture bike with a bit less solar arrived two days later. For everyday use I'd like to try to layout a bike with a higher seat position for better visibility, but I still want to take my weight off of my wrists so the seat does need to be further back than on a normal mountain or road bike. A regular kitchen chair and the seat in my car are both about 18" high off the ground, so I'll see how well that will fit into the next layout. In earlier posts about bodywork I've mentioned the fully enclosed Belgian Velerique (which has holes for sticking out feet when stopping) and the open sided Reisefahrrad Läufer from the Mobilität Technische Universitat Munchen, but my main concern with these bikes is the tall side profile area making them sensitive to crosswinds (worse on the short wheelbase and long body length Velerique). 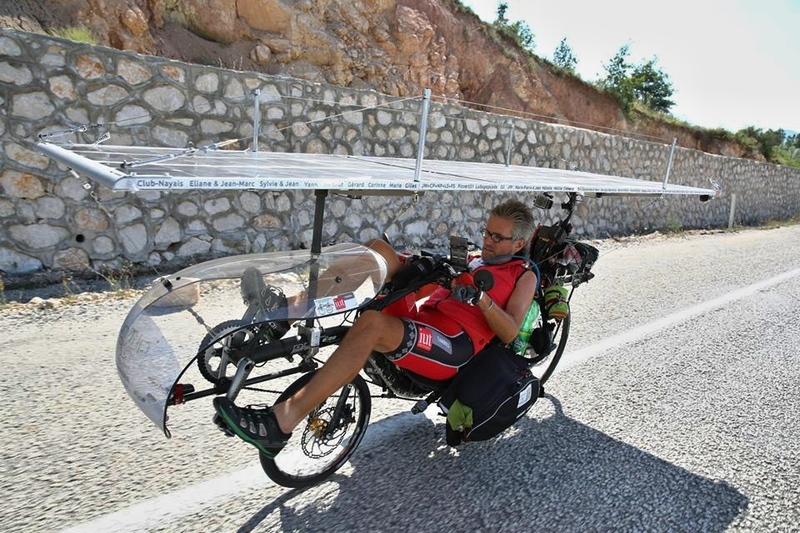 Some of the bikes in the Suntrip 2013 tour that had a high solar panel canopy over the rider would be tough to ride in a crosswind too. Although a trike would solve this problem, I would still like to work with two wheels instead of three because of efficiency, speed, and the narrow roads with rough shoulders around my region. To reduce the side profile area I'm thinking more of a fairing than an enclosed body, so that some of the crosswind can pass through it, in combination with a solar panel placed over the rider. Another advantage of using smaller fairings instead of a full body is that I'd like to try using ABS plastic for the bodywork instead of fiberglass for better impact resistance, and it would be easier to thermoform smaller pieces. In the late 1970's I was living far from power in the North East Kingdom of Vermont, and I tried to build some windmills (back then solar panels were very, very expensive). I used car generators and alternators, and the windmills sort of worked but mostly they didn't. Some of the windmill blades I carved in the early 1980's. 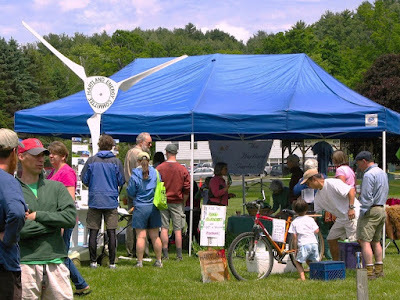 These weren't being used so I converted them into a sign for Hartland Energy Committee booths, such as this one at Farmfest 2009. In front of the booth is also one of the bike blenders. I poured through hundreds of NACA airfoil shapes and then carved some blades out of wood, and along the way I discovered sailplanes. The mid motor and propeller retract when in regular soaring flight. Other motorized sailplanes have been built with the motor located in the nose or tail. 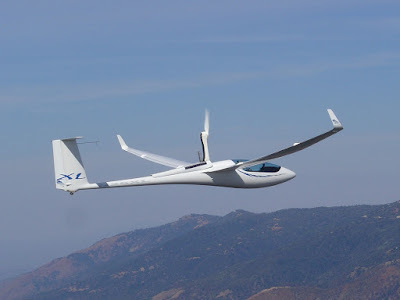 Materials were just becoming strong enough at that time to build long, thin sailplane wings that gave long glide ratios, and the planes looked beautiful, like soaring birds. 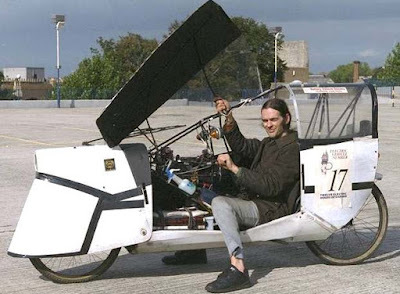 One of the reasons I like the Go-one 3 bike is because the body looks like a sailplane cockpit, and I don't think it is possible to have a much lower Cd on a passenger vehicle than a sailplane. Forty years have gone by and there are now sailplanes that can launch themselves using electric motors, which have already flown across the US and over the Alps. The last two main considerations in the design of my next bike have more to do with how a bike is used than with physical form, they are energy use and speed. Energy use is a high priority for me, and the efficiency of bicycles is one big reason why I like them. My home solar array is old and small, but I've learned how to live quite well on an average of 2 kWh per day (this includes running normal appliances and shop equipment). I've also insulated my home and use only 1.5 cord of wood per winter for heating and cooking (it's about 7000 (Fahrenheit) Heating Degree Days per winter here). I would like my transportation to meet similar efficiency standards, which means some streamlining is necessary. But streamlined bodywork will be just extra weight when going slowly up a hill, and may result in going too fast down a hill. 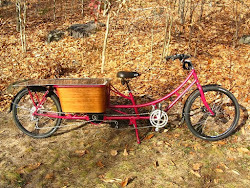 (My bakfiets and longtail routinely reach 40-45 mph when coasting down local hills with no streamlining.) I'd like to leave out regeneration during braking on the next bike in favor of coasting to increase my average speed, (in many competitions like the Shell Eco Marathon coasting is an important part of the driving scheme), but I don't want to be riding the brakes dumping energy even more than normal when going down long hills. Streamlining might require a different drivetrain design to make it work well. Last but not least is speed. I've been thinking about speed for several years now and it's still an open question. Almost all my riding is for errands, and the time it takes often matters. With streamlining and an electric motor it's possible to build a very fast (and legal) bike, but practically speaking where does a 60 mph bicycle belong? When riding on a bike I love looking around and seeing things, instead of focusing down the road in a car in case you're about to hit something. 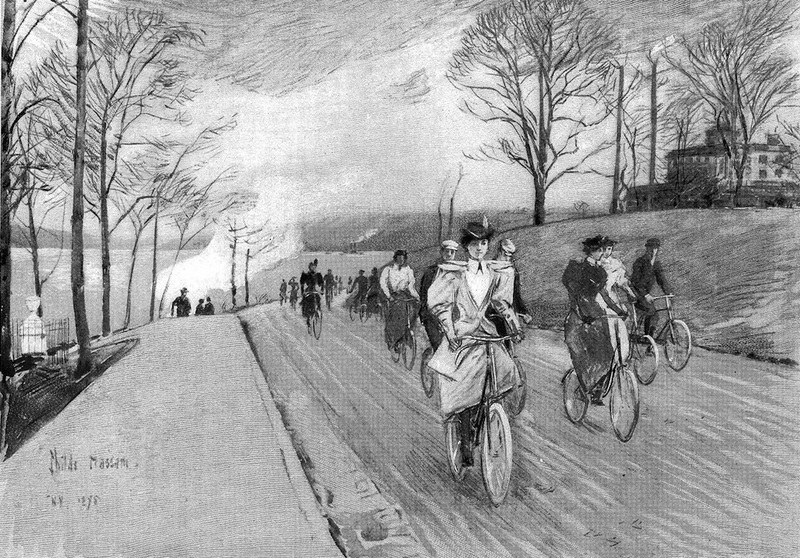 Maybe being able to substitute a bicycle for a car is the wrong question. When I compare walking like Thoreau did versus traveling at race car speed it's easy to decide which one is more alive. I can't help but think that while cars have some good, positive abilities, they are also more than a bit over the line in significant negative ways and sometime we'll look back and say they were great fun while they lasted, but they turned out to be just a sugar buzz. I don't expect this to happen anytime soon, as James Woodcock and Rachel Aldred point out in their paper "Cars, corporations, and commodities: Consequences for the social determinants of health", 9 of the top 10 Fortune 500 corporations in 2006 were either car or oil companies. I don't think addictive sweets like cars are going away easily. 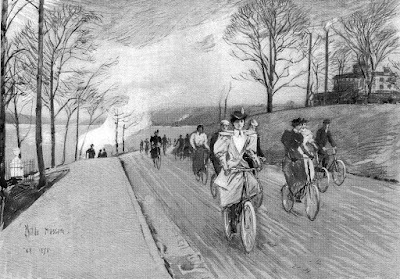 So for this moment traveling faster does help my bike design coexist on roads that were built for a car culture, but it's not the only consideration, is that how we should expect moms and kids to ride too? I think that coasting and streamlining will be more effective than what I'm doing now, but I also don't want to leave out the benefits of bicycling slowly. Anyhow that's a few of the thoughts floating around in the background as I pick out the pieces for building the next bike. Giantplus is one of the best online electric bicycle Company in North America & Europe. You can buy electric motor for bicycle and bike with best price.